**Still adding photos and video as they arrive to us. 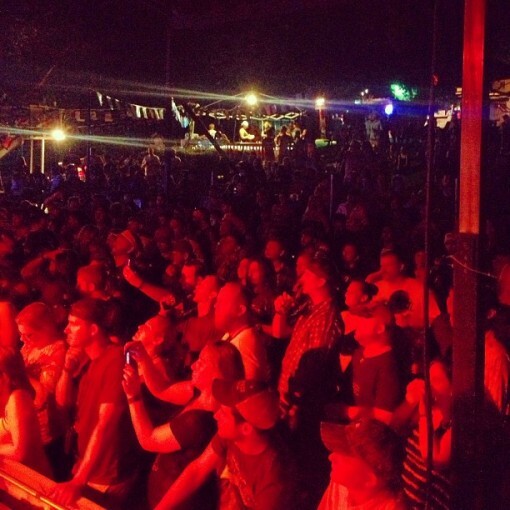 Photo credits thus far go to: Jon Paul Long, John Dempsy, Brian Strickland, River Road Icehouse and Anna Sneed. 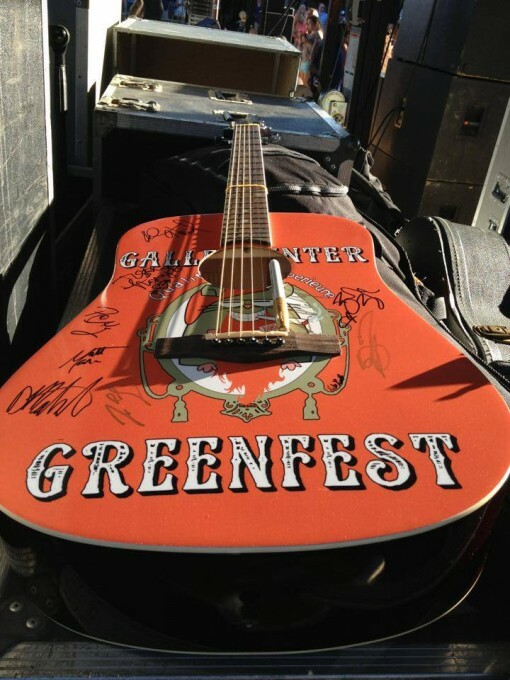 Greenfest is a labor of love that we undertake each summer. Our goal is always to put bands that our website and community support in a cool venue, keep the costs as low as possible for the true music fans and allow everyone to have a good time. After several years of having downsized the event, we decided to go full-throttle once again and amp things up with a line-up of six amazing bands and a return to River Road Icehouse. We then set out to craft a Sunday acoustic line-up that would be nothing but lyrical heavyweights. Thankfully, a bunch of you guys thought the whole idea was cool too and showed up in huge numbers to support the event. Many months and long hours of preparation and planning went into making GF13 a reality. With so many moving parts and three cooks in the kitchen sometimes information and communication at times became difficult to keep up to date. However, I’m proud of the way me, JP and Tank pulled this off. Even if one of us ended up passed out in the parking lot before the last note rang out Saturday night. Our host for the past five years of Sunday events has been Terry Gillespie and the fantastic staff at the Lone Star Floathouse. If the area of the Guadalupe River that surrounds the Floathouse isn’t heaven on earth…it’s close. A river outfitter crossed with a bar and grill with a sublime location seems like a perfect spot to host a songswap…and it has been for five years now. When it came time to choose a venue for the Saturday night full band bash, it didn’t take us long to select the revamped River Road Icehouse under the new ownership of Nick Sisoian. Nick has assembled a top-notch staff that made our jobs so much easier. Even during the most peak crowd Saturday, nobody had to wait more than 5 minutes to grab a beer and everything ran super smoothly. That’s a tribue to Nick and his RRIH staff. Special shoutout to Alan Beavers for handling the production hassles of setting up and tearing down six bands on a tight time schedule. Possibly the most important person to the smoothness of Saturday’s logistics was Ryin Jones and his Preferred Fan company handling ticketing issues and the door. No small feat that there was not one problem. We arrived at RRIH early in the afternoon on Saturday. Mother Nature blessed us with overcast skies and a breeze gentle enough to make you forget you were outside in late July Texas. We immediately set about with final preparations and loading in the Cross Canadian Ragweed special liquidation sale merch. Before we knew it, it was time for doors to be officially open and next thing you knew, you guys started showing up. At first in a slow trickle, but before long a steady stream that would remain entering the gig until way past 11PM. 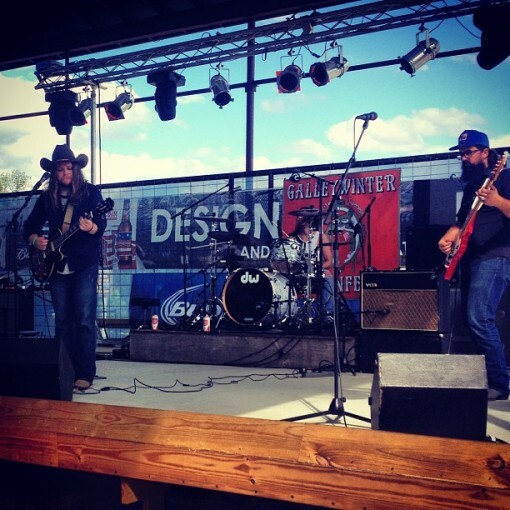 Up first on the mainstage were Fort Worth rockers Quaker City Nighthawks. These guys are one of the hottest new bands on the scene…and with good reason. 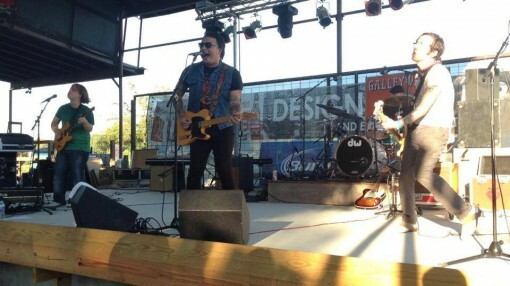 They deliver a foot-stomping southern rock vibe reminiscent…more Allman Brothers than Skynyrd. Twin guitars, keys and some groovy songs, these guys are going places. The early GF13 arrivals were treated to a blistering set that packed an impressive musical punch. Following QCNH was Josh Weathers. Returning to GF with his full band after playing acoustically last year, Weathers took command of the stage and didn’t let go until his amp finished ringing upon completing his final song. Weathers is more Motown than Nashville. And more soul than country…which makes him cool and unique. He is a gifted entertainer and his band of seasoned pros know how to rock a crowd. Weathers capped his set with a rousing rendition of Eddie Cochran’s “Summertime Blues” that included a Beastie Boys “Fight for Your Right To Party” interlude. Javi Garcia strode onstage next to deliver a bit of his dark, edgy Springsteen-esque Texas rock n’ roll. The energy level was rising and the sun was starting its decline as Javi was wrapping up a set that found K Phillips join him on harp for a tune. Javi’s mystic intensity can be a little jolting for an audience at first, but once you dig in past the gruff vocals you find some deep lyrical brilliance backed by some tasty American rock n’ roll. This night was no different. K Phillips would then proceed to have the next GF13 set. He was joined by a brilliant 7 piece band, his Concho Pearls, replete with a sax and trumpet. 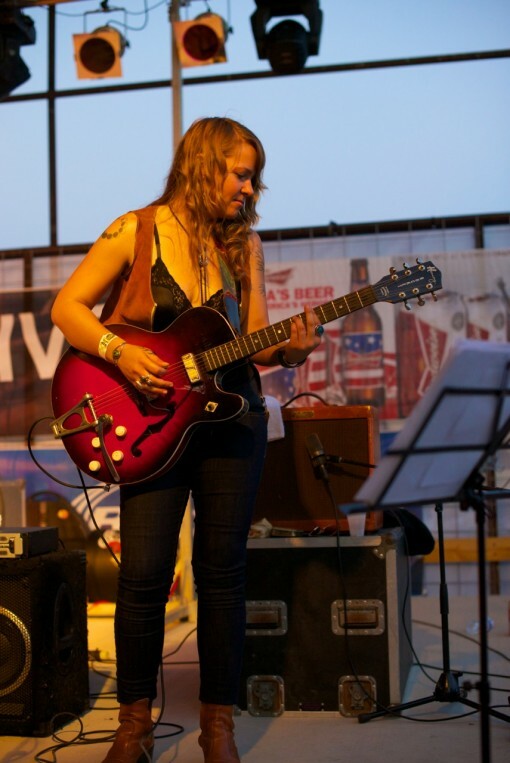 Sitting in with the Concho Pearls on this night was the lovely and supremely talented Brandy Zdan. Her harmonies and energy combined with Little Brave on the bass juxtaposed nicely with K’s ambitious and jumpy troubadour as revivalist preacher type act. K’s an interesting and unpredictable performer. Long and vivid soliloquy’s accompanied each song introduction and the packed house hung on his each word. Midway through the set, K turned into equal parts Jerry Lee Lewis, Axl Rose, Iggy Pop and Keith Moon as he sprayed beer on the band, equipment and crowd, chugged a bottle of Jack Daniel’s and proclaimed that GF13 had just gotten a bit too “stuffy” at the moment. He proceeded to jump into the crowd and take the Concho Pearls on an obscenity laden punk rock interlude. K’s knack as an entertainer is he read the crowd properly and nailed this bit of performance art. By the time he was playing “To Dance With You”, the entirety of River Road Icehouse was doing just that. The glue that holds Greenfest together, Adam Hood, hit the stage next. Joined by Ross Smith from the Wade Bowen band on keys and guitar and Allan Goodman on bass, Hood strung together a typically fantastic set of Americana rock packed with a soulful vocal punch. The crowd was rapt and boisterous as they sang along with songs from every era of the Hood catalog. Adam Hood has played the full band night of Greenfest many times and each time he ends up the night’s MVP. This set was a special Adam Hood offering. He pours his heart and soul into each show…but you can always tell he pulls out a little something extra for the Greenfest crowd. Uncle Lucius was set to close the show. They were coming off a fantastic gig at Antone’s the night before and were dealing with some gear issues that involved a blown amp or two. But, they rolled into GF13 with their game faces on and from the moment their van rolled up, you knew it was going to be a special set. Prior to their set, we made one last announcement for the autographed guitars that would benefit their hunger initiative. The merch booths were packed all night long. 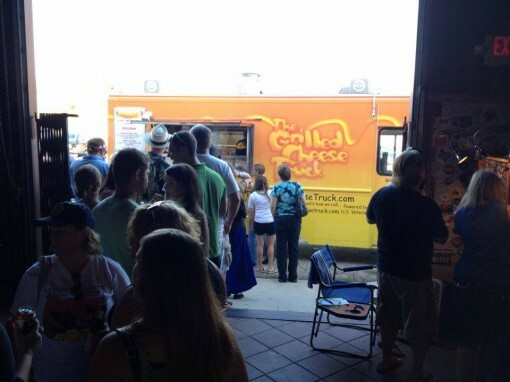 As was the line to the Grilled Cheese Truck. Mattson Rainer had been our emcee for the night up to this point. At this point, Mattson told JP and myself that we should bring on Uncle. Saying it was our party, our festival, and JP’s favorite band. In Mattson’s words, the extremely large turnout of folks to celebrate this music was a “reckoning and a validation that appreciation for good music is still very much alive.” This verbal reinforcement backed up what my eyes and the door numbers were telling me. GF13 was going to be a huge success. 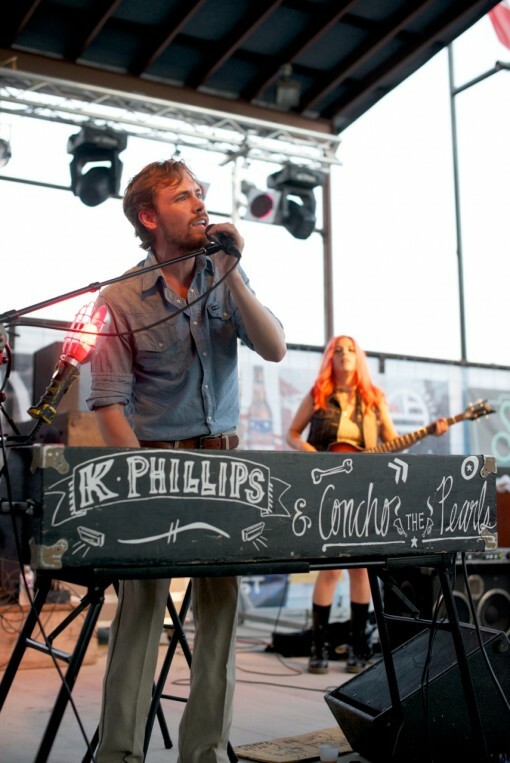 Around this time, the stage was finally ready to be rocked by everyone’s favorite Texas Music Uncle…Lucius. Kevin Galloway and company went full-throttle from the first note on. There was a huge crowd by this point and it was super cool to see the reception UL and Adam Hood received. Crowd singalongs and rowdy appreciative hoots and hollers followed each song. Uncle Lucius kept the wolves away and showed the crowd that there are many bands that are something they ain’t. For several weeks prior to GF13, the artists had been loosely planning a traditional end of the night jam. With the passing of JJ Cale earlier in the day, it was automatically turned into a JJ Cale tribute of sorts. K Phillips somehow orchestrated and stage directed the whole deal and as it was literally about 45 minutes after midnight, about 17 musicians jammed out on “After Midnight” among other classic Cale tunes. It couldn’t have been any cooler. After tying up the many loose ends of the night, we proceeded to find ourselves in the mad dash for cabs and designated drivers as we made our way to the truck. The post euphoric endorphin rush of a job well done was hard to come down from as we sat on the banks of the Guadalupe River at our campsite about 1 mile up the road from RRIH. At one point many hours into the early dawn of Sunday morning, I made myself get some sleep. I wouldn’t stay asleep for long. I was the first one up in our RV. It was a little before 8AM as I headed outside to chug some caffeine and take in the babbling brook of the Guad as it ran calmly below me. Watching the world come alive and reflecting on the night before was a magical couple hours. Eventually, we straggled back to town to grab some breakfast tacos at Los Gallos and swing by the hotel where we’d put up a few of the bands. The hotel manager told me in broken English that the “young men” who stayed there had caused him great “displeasure” as they had races on the housekeeping carts and threw items off the balcony. Outwardly I apologized profusely, yet inwardly I chuckled as I envisioned the shenanigans that took place a few hours earlier. Greenfest hotel traditions are holding strong. After digesting some of the world famous Los Gallos and sneaking in a quick nap it was time to hit the water. We opted to hang out in the water instead of actually doing a float. We had a great spot on the Guad, an anchored pop up tent, old friends, great tunes blasting, a couple full coolers and ample people watching. The afternoon began to fade away much too quickly as we were having too good of a time. Before I knew it, it was time to dry off and get to the Floathouse. After searching for a parking spot for several minutes, I found one on the front row. As I went to exit my truck I saw Nate Rodriguez pull up at the same time. Nate is quite honestly one of the most talented musicians and singers I’ve ever known. It’s a crime that he has yet to put out any recorded output. Finances have continually gotten in the way, but we are working on helping him fix that. Possibly with the help of his GF13 setmate, John Dempsy (with no second e). 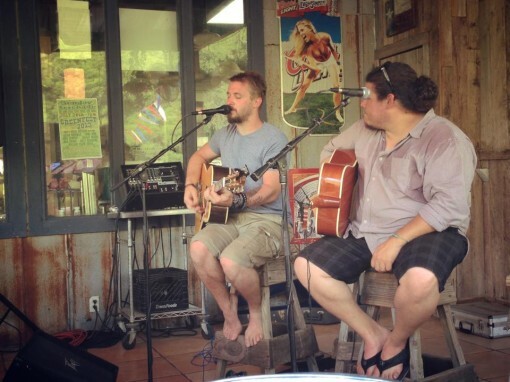 JD’s been a longtime admirer of Nate’s ability and a peer in the central Texas music scene for many years. Their pairing as the opening act of Day 2 looks like a stroke of genius in hindsight. 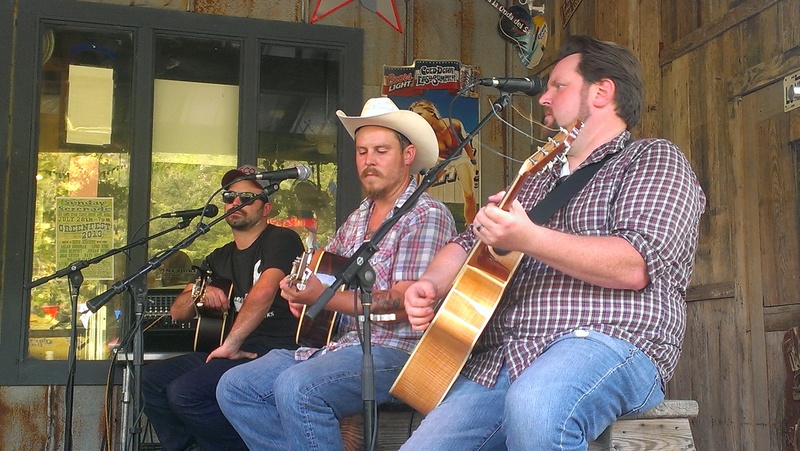 JD began the set by explaining that he lives in West, TX and would like to get the sad stuff out of the way first. He then went into one of the most emotional song deliveries I’ve ever seen as he sang his “Heroes and Angels” to a packed Floathouse. The loud rowdiness faded with each passing line as everyone gave JD their full attention. By the time he reached the chorus the second time, I noticed many in the crowd sobbing. The song details how he knew many of the guys who perished in the tragedy and that now “heroes and angels are both friends of mine.” Nate is one of the only cats I know that could match that emotional intensity and for the remainder of the set, these two talented guys traded songs, licks, stories and good humor. They played well together and if there’s any justice, bigger stages await them. Next up was Chris King, Jordan Minor and Allan Goodman. King, much like Uncle Lucius the night before, showed up ready to play. He was someone who many of us were excited to see on the GF acoustic stage again. Since the last time King played GF his career has skyrocketed. His songs are country and genuine. So is his performance style. Minor is a prodigious songwriter starting to gain traction on the strength of his songs and a busy touring schedule around New Braunfels. Goodman is everybody’s friend. His name says it all. He’s a good man. Last year at Greenfest we sadly learned of Goodman’s cancer diagnosis, so him being back full strength and healthy to play both nights of Greenfest was a hugely cool deal. 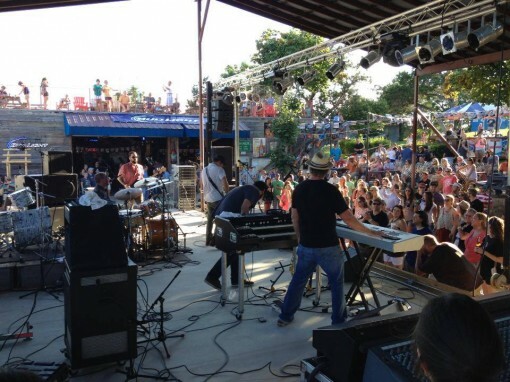 The next pair featured two of the hottest acts on the Texas scene, William Clark Green and Zane Williams. WCG is fresh off having the biggest song of the summer at Texas radio with “She Likes the Beatles” and Zane is quickly rising up the rungs of the Texas Music ladder due to his strong song craftsmanship and affable stage persona. 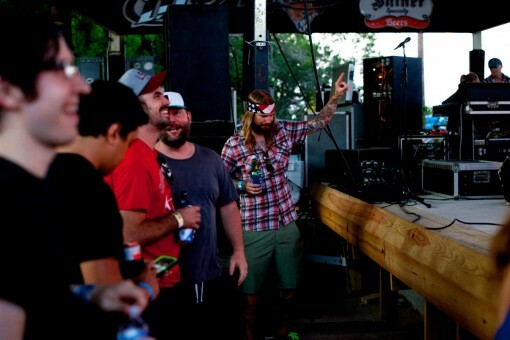 Zane had received his Floathouse burger minutes before their set was to begin and took it to the stage with him. He kindly asked WCG to start the set so he could finish his meal first. These guys played everything you wanted them to play and more. 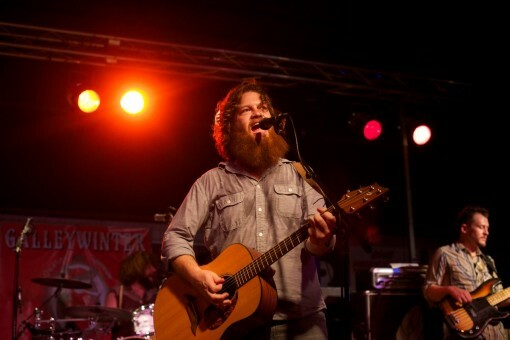 At one point, WCG even busted out a cover of Chris Knights’ “Enough Rope”. There was a moment when Zane got serious and talked about missing home and his family. He began to introduce the song “While I Was Away” by detailing that each time he returns from a touring run his son looks older…even if it’s just been a couple days. As he hit the moving chorus, many men in the crowd were trying to be pillars of masculinity and not cry at the bar. This brief acoustic set was a testament to why these two guys are rising in popularity. They know how to write real songs and deliver them in a manner that connects with audiences. We will be doing more things in the future with both of these acts. Class guys. The final set of the night was led by our host and Greenfest anchor, Drew Kennedy. 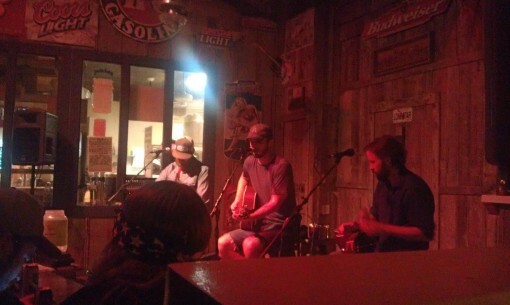 On this night he was joined by friends and longtime Galleywinter favorites Josh Grider and Owen Temple. It doesn’t get any better than these three guys. 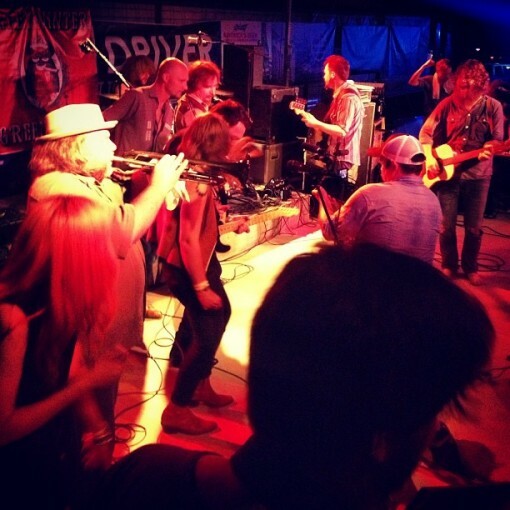 Their song catalogs and ability to entertain in an acoustic songswap environment are unparalleled in the modern Texas scene. The songs, the jokes and stories were timeless. DK played many numbers of his upcoming release, as did Owen. Grider even snuck in a few new cuts. Brandy Zdan joined Drew for a song from his new album and sang one of her own. She rightfully pointed on to us on Twitter that we had a severe lack of female artists this year. We’ll rectify that next year. In the meantime, thank you for jamming both nights Brandy. You are amazing. The highlight of this set was arguably when Drew started around by playing a Darrel Scott cover then suggesting that this round be the covers section of the evening. Grider followed suit by doing a charming version of Willis Alan Ramsey’s “Northeast Texas Women”, which was suggested by my table by the way. Owen Temple sat contemplatively on the end of the stools and decided his cover would come from the legendary Gary Floater. The roof of the patio darn near blew off as Temple tore through “The Dirty South”. Later in the set, Temple would revisit the venerable Floater catalog a couple more times for “Y’all Watch This” and even ended the night with “Grandpa’s Promise”. 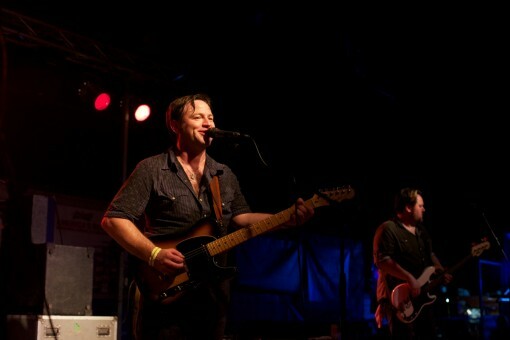 Temple is a survivor of the halcyon days of the late 90’s Texas Music revival and his music has only gotten better. He now has more in common with Guy Clark’s templates than that of Pat Green…and that’s a good thing for all of us. This set epitomized everything we try to do here. Three guys that the crowd loved and supported playing with sheer joy, fun and passion. What started so many years ago as a way to meet up with folks you knew from the music message boards has grown into…in the words of Mattson Rainer once more…”a reckoning, a validation…” that good music is alive and well…and good music fans are too. Thanks for coming to Greenfest 13. See you next year! Fantastic Job Fellas! Glad to hear yall had a successful event! Keep on Keepin’ on! I used tto be suggested this wweb site through my cousin. else know such targeted about my trouble. You’re wonderful! I simply want to say I am newbie to blogging and site-building and certainly enjoyed this web site. Most likely I’m likely to bookmark your blog . You really have terrific article content. Thanks a lot for sharing your blog site. puppies and dogs are very cute, i always love to play with them during my spare time. Great post. I was checking continuously this blog and I’m impressed! Very useful information specially the last part :) I care for such information much. I was looking for this particular information for a very long time. Thank you and good luck. I am not positive where you are getting your info, but great topic. I needs to spend a while learning much more or understanding more. Thank you for fantastic info I used to be on the lookout for this information for my mission. Hi, Neat post. There is a problem along with your site in web explorer, could check this¡K IE still is the market leader and a huge part of other folks will omit your wonderful writing due to this problem. I and my guys happened to be digesting the great ideas found on the website then quickly got a horrible feeling I never expressed respect to the site owner for them. All the boys were so excited to learn all of them and now have sincerely been using them. We appreciate you really being simply helpful and then for deciding upon certain notable subject areas most people are really desirous to be aware of. My sincere regret for not expressing gratitude to earlier.